Feeling dry? 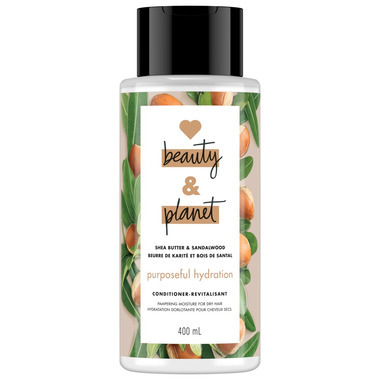 Love Beauty and Planet has got just the thing to butter you up. Their Purposeful Hydration Conditioner, specially designed for hair that’s prone to dryness, seals moisture into your strands and gently conditions hair for supreme moisture and enhanced definition with smoothness. Plus, with fast-rinse technology in each of their conditioners, you get light weight conditioning and also feel good knowing that you can help save some water since the conditioner breaks down faster. If you have curly hair, the moisturization of this product is a blessing. And while you are at it, indulge yourself in fragrances infused with ethically sourced Australian sandalwood. This conditioner exudes a harmonious scent with creamy, exotic and woody balsamic notes. Made with shea nuts sourced from Ghana and Burkina Faso, where farming is key to the community. This shea butter is made according to long standing traditions, first melted under wood fire and then cooled overnight.